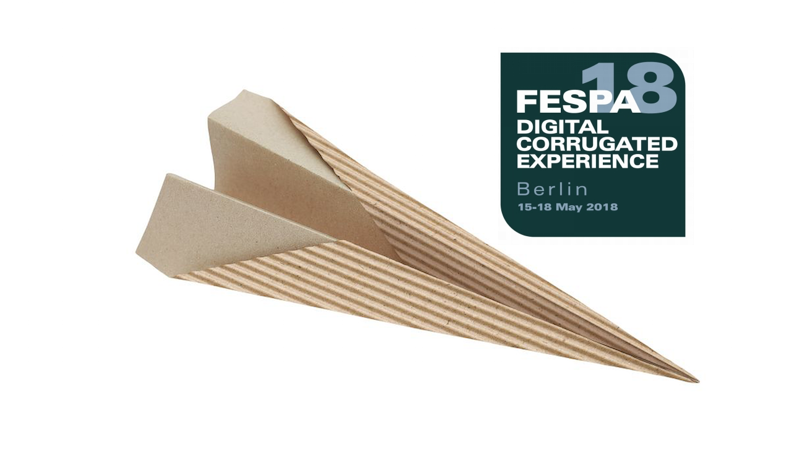 FESPA will introduce a new Digital Corrugated Experience at FESPA Global Print Expo 2018, which is taking place from 15-18 May at Messe Berlin in Germany. FESPA’s Digital Corrugated Experience is an educational and experiential area, which will showcase the commercial and production advantages of digital print for corrugated packaging and retail display applications, aiming to highlight to packaging converters and box-makers the benefits of integrating digital technology into their production mix. The Digital Corrugated Experience will address all elements involved in printing corrugated materials, including: substrates; workflow solutions; digital printing technologies; materials handling; primers, inks, coatings and varnishes; and cutting and folding. Digital print complements traditional analogue methods, enabling converters and display makers to expand their offering with prototyping, short-run, versioning or customisation of boxes and displays. Located in Hall 5.2 at Messe Berlin, the new area will have a different format to the rest of the FESPA 2018 exhibition. It will combine short educational Print Corrugated conferences with business-building discussions with industry-leading suppliers, among them HP, Lamina, Sun Automation, Inca Digital and BCS- Autobox. Participating conference speakers will include independent industry specialists, experts and brands. Visitors will also gain inspiration and knowledge from a showcase of digitally printed corrugated applications, such as shelf-ready and transit packaging boxes, pallet surrounds, promotional packaging and POS displays, supported by like-for-like printing comparisons, samples and narratives helping visitors to evaluate the wide range of commercially available solutions. The launch of a FESPA Digital Corrugated Experience reflects growing interest from both the packaging and speciality printing communities in the technology solutions, materials and workflows required to take advantage of digital print for short run and customised packaging. This is supported by independent research by Smithers Pira, which predicts that digitally printed corrugated material will accelerate from a global value of $1.44 billion today to be worth over $2.35 billion by 2020. FESPA CEO Neil Felton explains: “FESPA has been a leading force in the transition from analogue to digital print in the signage and graphics market, guiding our community of printers and sign-makers on the integration of digital inkjet technology alongside their analogue production processes as a driver of business transformation. Felton continues: “When it comes to corrugated, many of our exhibitors have expertise in preparing, printing and finishing these materials for signage, display and packaging applications." Luis Christophe, EMEA Corrugated Segment Marketing Manager at HP, a sponsor of the new feature, comments: “HP is very pleased that FESPA is organising a dedicated Digital Corrugated Experience." FESPA Head of Events Duncan MacOwan concludes: “FESPA’s Digital Corrugated Experience aims to offer an excellent return on time investment for corrugated box-makers, converters and large format print service providers who are interested in entering the short-run packaging market."